For those of you following along, I’m doing a post a day all month long as part of a blogging blood pact (I mean, challenge) with my pals Amanda Hollinger, Monica Wyche, and Ami Worthen. The theme is relative. 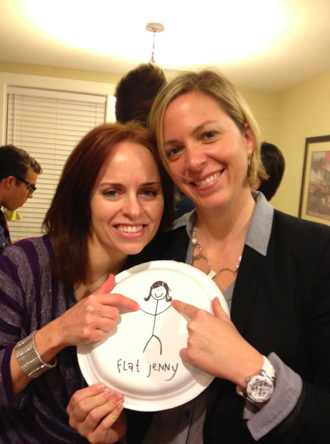 As in, I’m relatively certain that I have the finest assortment of friends around, as evidenced by the fact that they will bring a flat version of me (see Flat Jenny below) to exciting events that I cannot attend. In fact, it seems that the flat version of me gets to places the real me can only dream about. Those are the breaks, kids.